Pam Longobardi is an internationally acclaimed artist, scientist, and activist currently living and working in Atlanta, and is a Professor of Art at Georgia State University. In both public and private collections, with exhibitions across the globe, in museums, galleries and public spaces, Longobardi continues her collection, examination and exposition of the physical marker of the Anthropocene, the drifting plastic object. In 2014, Longobardi was awarded the title of Distinguished University Professor, and has been named Oceanic Society’s Artist-In-Residence. 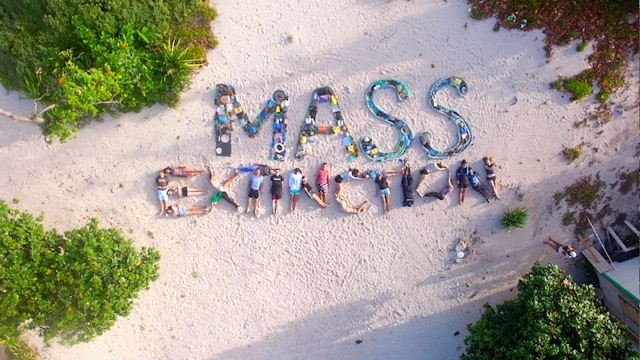 Volunteers from Oceana, Oceanic Society and National Geographic participated in this message with collected plastic from remote and tiny outpost island. Oceanic Society Research station, drone photograph by Eric Ramos. Installation view, Hudgens Prize solo exhibition 2014. Detail, 2013. Microplastic, plastic, hydrocarbons, and steel. 72 specimens of ocean plastic removed from beaches of Alaska, Greece, Hawaii, Costa Rica, Italy and the Gulf of Mexico, beginning with a single styrofoam ball from a sea cave in Greece to a 15 lb. hard plastic net float from Katmai National Park beach on the Alaskan Peninsula. The Drifters Project is a collaborative global artistic research-based initiative involving the accumulation, documentation, and transformation of oceanic plastic into installations and photography. Longobardi provides us with a visual statement about the engine of global consumption and the impact of plastic objects on the world’s most remote places and creatures. With Ephemeral Coast, Longobardi will speak to her Drifters Project in Ottawa, Canada, alongside the first Canadian exhibition of her work. She is also a contributor to a workshop held at the University of Ottawa to engage scholars, researchers and activists in interdisciplinary discussions around the changing state of the world’s oceans and coastlines. Pam Longobardi was the Feature Artist in the 'Junk Ocean' issue of Drain Magazine, which was published in dialogue with Ephemeral Coast. Click here to see her interview with Celina Jeffery.